UCGIS is pleased to announce that Dr. Daniel A. Griffith, an Ashbel Smith Professor at the University of Texas at Dallas, has been selected to receive its 2017 Research Award. His research has contributed to the methodological and theoretical developments of spatial statistics and spatial data analysis in GIScience. In doing so, he has developed novel methodologies that provide analytical frameworks for statistical spatial data analysis and modeling, such as the eigenvector spatial filtering (ESF) approach to account for spatial autocorrelation in regression. ESF has been widely adopted in multiple disciplines, including ecology, economics, epidemiology, geography, regional science, spatial crime analysis, statistics, and transportation. His books have included Spatial Autocorrelation and Spatial Filtering: Gaining Understanding through Theory and Scientific Visualization (2003, Springer), and Spatial Autocorrelation: A Primer (1987, AAG), one of the first publications to comprehensively describe the concept of spatial autocorrelation, spatial autocorrelation indices, and the impact of spatial autocorrelation on statistical analyses of georeferenced data. 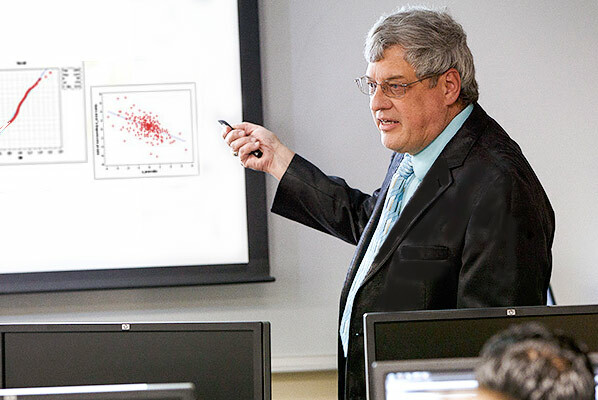 Utilizing his expertise in spatial statistics, he also has made innovative contributionsto urban and economic geography, and has investigated public health issues emphasizinggeographic perspectives in environmental health, medical geography, and health-environment issues associated with urban and social conditions at the local level. One among many of the national and international awards he has received includes having been elected a fellow of the American Statistical Association in 2015, the only geographer to date who has achieved that distinction. UCGIS will honor Dan Griffith and other award recipients during its annual Symposium in May 2017 in Arlington, Virginia.